Sea our Storytelling for Kids! What an ocean commotion we made at our “Under the Sea” workshop for kids (of all ages) these school holidays! Mermaid Michelle (aka. 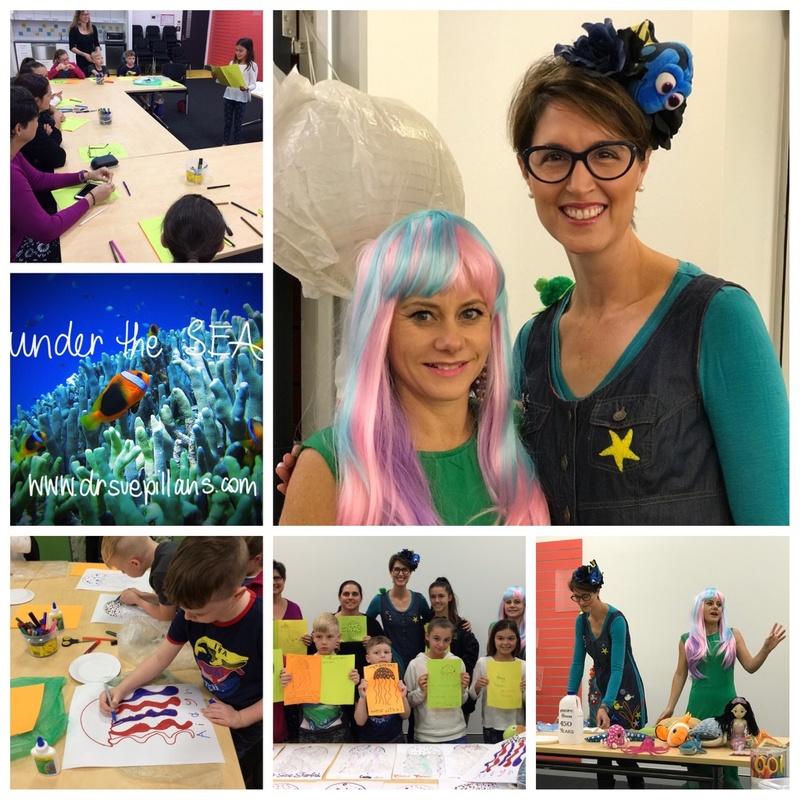 Michelle Worthington International award-winning children’s author ) and my alter ego Dr Suzie Starfish used the art of marine science storytelling to talk about plastic pollution in our oceans. Marine debris and litter is one of the challenges our oceans and sea creatures are facing as people ‘trash where they splash’! We talked about how long it takes for plastics to break down. Did you know it takes 10 – 1000 years for a plastic bag to decompose?!! So what can we do about it? The kids all knew how, by calling out “Reduce, Reuse and Recycle (…and Refuse)!” To put our recycling to work we created some amazing looking jellyfish art by re-using plastic bags! Mermaid Michelle then took the group through the process of creating your own picture book story using jellyfish as the main character. Michelle took us through the steps of writing stories with messages of hope. We even got to hear some of the stories from jellyfish flying through space, jellyfish singing too loud and jellyfish in search of their love hearts! There were some great ideas for some best-selling kids picture books in the room which made us laugh and cry! WOW! Mermaid Michelle and I had a FIN-tastic day with the group and we can’t wait to dive in and make a splash with children of all ages next school holidays! A special thank you to our helpers from the Share your Story Tribe. You can find out more about our upcoming creative STEM workshops via my Workshops (September school holiday workshop details coming soon!) and at Dr Suzie Starfish on Facebook and @suepillans on Twitter and Instagram. Best fishes and mermaid kisses from Mermaid Michelle and Dr Suzie Starfish! ← Picturing the Strategy for the Top End! Thank you so much for your wonderful feedback! We love engaging with kids about the science of the sea through storytelling!